I'm here - in Orlando! Stuff's happening - I have soooo much to show you. Once again I am working on the tablet - but this time I have the little matching keyboard, and Blogger have updated their android version - BWAH HA HA HA HA HA There is no escape! I am meeting up with Zontians and other Disney Freakaphiles - my schedule is changing minute to minute - hopefully I get something up that has a semblance of cohesion. Here's a quickie food post to keep you going. Day 3: Teppan Edo - the teppanyaki restaurant in Epcot's World Showcase. There must be 20 teppanyaki tables in here, each of which seat 9 people. In a small attempt at authenticity, Disney run an international exchange program for hospitality students and graduates. These people are drawn specifically from the countries to man the corresponding country showcase. So all of the staff in Teppan Edo are Japanese. But all the food is very very safe for your average Disney customer. No unagi, no dried fish - and definitely no natto! I was alone and was seated with a family - I know nothing about and cannot share anything - except the young girls you'll see in the photos were astonishingly quiet! Not a peep. Boy, the chef had to work hard just to get them to watch him! were they pleased to be here, or what? let's get on with the food. The appetizer choices include a small dish of edamame, a "salad" which consisted on a plate of chopped iceberg lettuce with a sweet dressing. Sushi rolls and sashimi tuna. 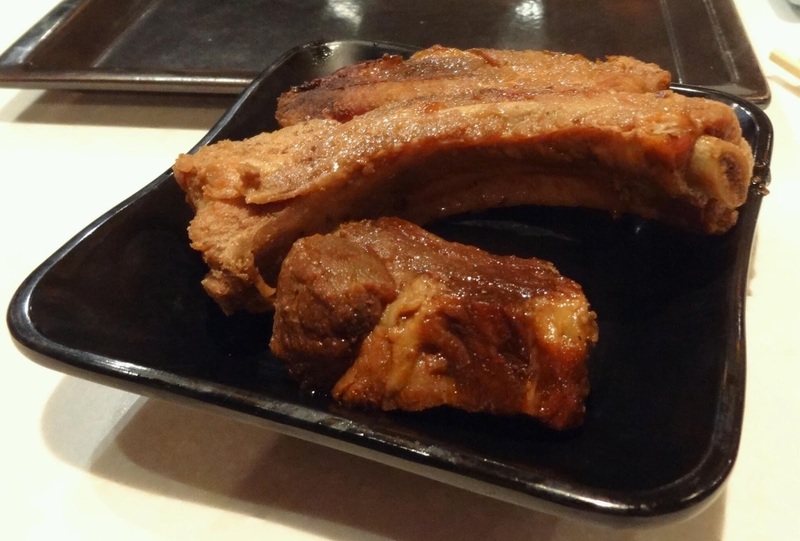 I had the Waku Ribs - pork ribs marinated in ginger, garlic and soy and reheated on the grill plate. This was BBQ heaven! They were very tender - fall off the bone - very tasty and moist. I was so pleased - and the 2 blokes sharing the table were also very impressed. I'm a real man. For the main, everyone scores a bowl of rice, udon noodles which have been fried with onion and zucchini, and fried mushrooms. Your choice is the protein. You can mix and match or just have one. They offer fillet mignon, sirloin steak, chicken, prawns, and scallops. I chose to have half & half sirloin and prawns. The prawns were fine - but nothing special. The steak was very good - moist, cooked to order (medium rare), very tender and had a meaty steaky taste. I didn't do dessert - this time. They do offer green tea pudding, chocolate and ginger cake, and ice cream. The cake is a very light sponge and has a very mild ginger teint to it. They could stick more in and make the flavour distinctive. The green tea pudding has so much sugar in it, the green colour is merely a nod to its design. Teppan Edo is 2 Mr Creasotes - not too heavy - but more than I could finish. And only 2 spoonfuls of sugar - nice and good fun but not a meal you'll rave about. If only they threw the rice and prawn heads at me!